"The Allied and Associated Governments affirm and Germany accepts the responsibility of Germany and her allies for causing all the loss and damage to which the Allied and Associated Governments and their nationals have been subjected as a consequence of the war imposed upon them by the aggression of Germany and her allies." -Article 231 of the Treaty. Prostrate Germany and her allies were forced to sign this "war guilt clause" in the Versailles Treaty and therein lies the most dangerous heritage of the peace settlement. A proud nation is branded an enemy of society. This charge, which the principal Allied powers knew to be untrue, was the legal basis for the unprecedented reparations and disarmament clauses of the Treaties. It is now definitely established that the charge is false. As a result of revolutions the Romanoff, Hohenzollern and Hapsburg houses fell. Their secret archives then became available. Investigation of the documents for the period from 1870 to 1914, by unprejudiced historians, has made available all of the relevant facts. * In 1926, the British Government, at the request of distinguished historians, decided to break its silence and released its diplomatic documents for the period June 28 to August 4, 1914. Finally France, in 1928, was embarrassed into gradually releasing some of its documentary evidence. It is now conceded that the previous French Yellow Book (1914) was full of fraud and forgery. *Red Book and Kautsky documents, Austria and Gemany. Grosse Politik, Germany. Stieve collection, Der Diplomatische Schriftwechsel Iswolskis, from Russian Archives. Origins of the World War, Fay, Macmillan Co., contains complete, authentic appraisal of all the documentary evidence. 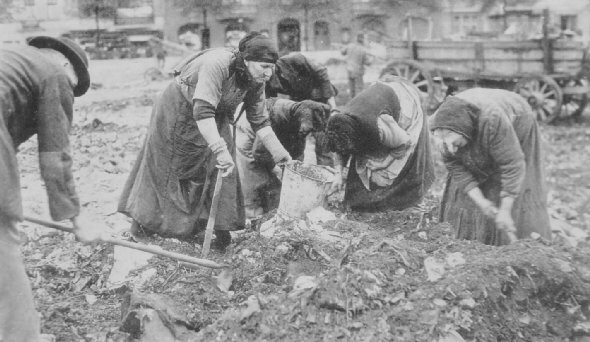 Old women of Berlin rummaging in the garbage dumps in search of food, in 1918. Europe seems to have forgotten, for the military spirit is again rampant in virtually every country on the Continent. Children are being given military drills, civilians are taught what to do in case of gas attack, bomb-proof shelters are being erected in metropolitan centers and fortifications have been reinforced along the frontiers.